I’m a pretty tall guy with a particularly long torso. That means, unfortunately, I can’t walk into most clothing stores and find things that fit me well. A few years ago, I needed a new suit for a particular occasion and I needed it pretty quickly. So, I went to a chain store that caters to tall men and found a suit that fit me really well. I was happy with my purchase. Since then, on a monthly basis (or more frequently), I receive a clothes catalog from this company. Most of the time, I do the sensible thing and immediately toss the catalog in the trash. 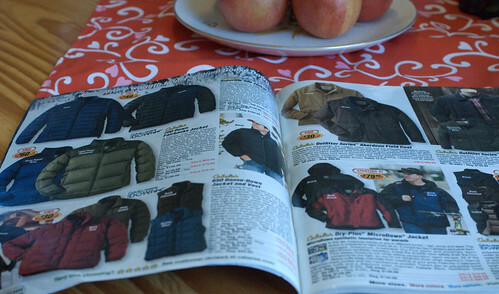 After all, a catalog mostly serves as nothing more than an opening to get you to buy things. It’s loaded with enticing pictures of things you don’t really need, often shot with aspirational touches that make you desire the item. That’s why it’s usually a bad idea to ever even open up the cover of a catalog. If you get one, just toss it. Sometimes, though, I’ll leaf through a catalog (we also get them from such places as Republic of Tea). Every single time I do, however, I find myself wanting something in the catalog that I had no interest in before I opened the pages. That’s the primary purpose of a catalog. It’s essentially a giant advertisement, and like any good advertisement, the main reason that it’s been given to you is to convince you to buy some of the items inside. The clothes look cool, clean, and crisp. The teas look delicious. The children’s items look intriguing and educational. Unless you’re wary, it isn’t long before you’ve convinced yourself that you need – or at least want – an item or two. When an advertisement creates an irrational desire to buy something, you’re on the verge of a financial mistake. Beyond that, catalogs are clutter. They take up space in your mailbox, likely take up some space in your home at some point, and eventually take up extra space in your trash. If you’re like me and you have to pay extra for disposal of materials beyond your container size, this can add up (thankfully, catalogs can usually be recycled). What’s the solution? If you can, cancel the catalog subscription. That way, you don’t have constant temptation in your mailbox and extra clutter to deal with. If you still get catalogs, just recycle them as soon as you get them.